Last week, former Vice President Joe Biden spoke at the Biden Courage Awards ceremony in preparation for his presidential campaign launch. There, in an attempt to forestall claims that as a white man, he simply isn't intersectional enough to compete in the Democratic primaries, he critiqued a central pillar of Western civilization as inherently racist. 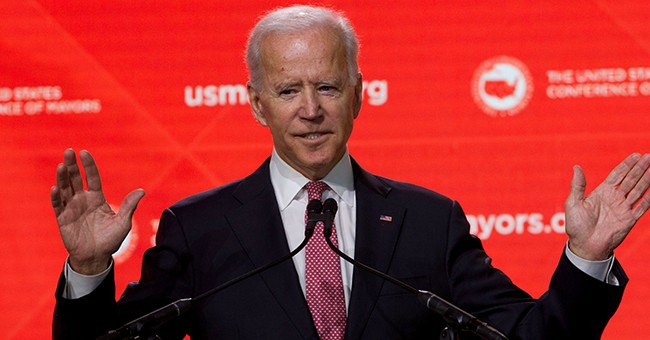 "Back in the late 1300s, so many women were dying at the hands of their husbands because they were chattel, just like the cattle, or the sheep, that the court of common law decided they had to do something about the extent of the deaths," Biden fibbed. "So you know what they said? No man has a right to chastise his woman with a rod thicker than the circumference of his thumb. This is English jurisprudential culture, a white man's culture. It's got to change. It's got to change." Biden's take was, as always, historically illiterate. The "rule of thumb" story has been circulating for years -- and it has been repeatedly debunked. There was no "rule of thumb," as feminist scholar Christina Hoff Sommers points out. "On the contrary," she writes, "British law since the 1700s and our American laws predating the Revolution prohibit wife beating." In actuality, the phrase originated in craftsmen so expert that they could perform tasks without precise measuring tools. More importantly, however, Biden's characterization of "English jurisprudential culture" as "white man's culture" is profoundly disturbing. English jurisprudential culture is rooted in the belief in the rule of law, due process of law, equal rights under law; English jurisprudential culture is responsible for preserving the natural rights we hold dear, rights which were imperfectly but increasingly extended over time to more and more human beings, particularly minorities. No less a leftist figure than Barack Obama explained just that in 2009, saying he sought a system at Guantanamo Bay that "adheres to the rule of law, habeas corpus, basic principles of Anglo-American legal system." Protection of individual rights -- and in particular, minority rights -- lies at the heart of English jurisprudence. Yet Biden boiled down those rights to racial privilege. And the attempt to reduce the fundamental principles of our civilization to a mask for racial hierarchical power is both false and frightening. It suggests that those principles ought to be undermined for purposes of disestablishing that supposed hierarchy. Get rid of English jurisprudential law, presumably, in order to fight racism. Ironically, reduction of Western civilization to racial supremacy isn't just a strategy of the intersectional left; it's a strategy of the despicable alt-right, which champions Western civilization as white civilization and then seeks to rip away the universalism of its principles from nonwhite people. Thus, the very term "Western civilization" is under assault by a variety of political forces seeking to tear out eternal truths and natural rights in the name of tribalism. But that's not what Western civilization is about at all. Western civilization was built on Judeo-Christian values and Greek reason, culminating in a perspective on natural rights that is preserved by institutions like English jurisprudence. It is thanks to those philosophical principles that free markets, free speech and free association have grown and flourished. Only if we re-enshrine those principles, rather than undermine them, will our prosperity and freedoms be preserved.